“Our homes are the repositories of our memories. 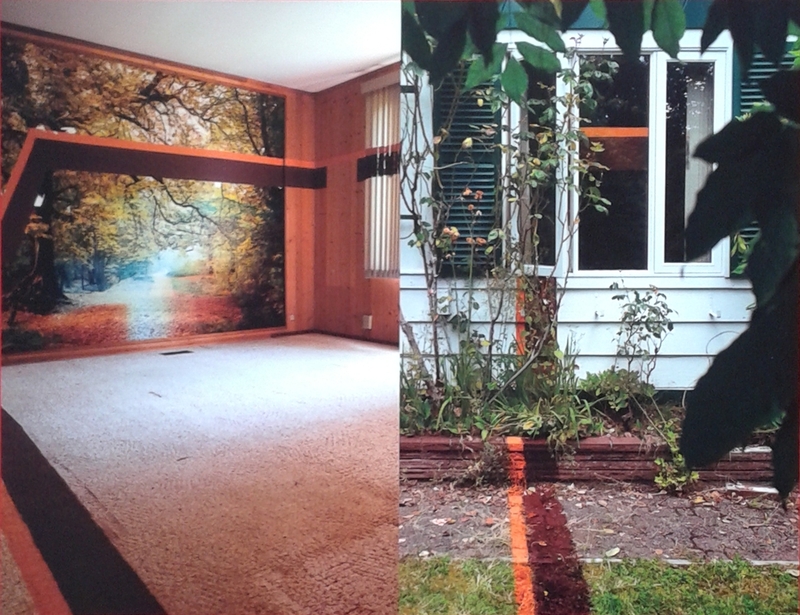 As our homes are renovated and changed over time, our memories of them are also overwritten. When a home is demolished, those repositories of lived experiences are destroyed. We may have memories in the form of photographs of the space, maybe a home video, but the physical materials imbued with histories of deep, personal, human interactions disappear. When a physical vessel for memories is demolished, it weakens the memory itself – so how well do our memories survive as we are continuously displaced, and our homes are eventually dismantled? “In Picture Window the artist’s hand is the hand of a labourer. The geometric pattern painted throughout this image is a found pattern from the home’s kitchen, where the stripe was painted on a cinderblock wall. It has been carefully carried throughout the home, touching every room, before going out the bedroom window. This line is transformed into a representation of the gaze of someone living in this house. It is positioned at head height and folloss a line of view through the home, pausing where a piece of art once hung, then continuing out the window.